is perfect for your baby. These top rated baby bath tubs edge out the competition due to many different factors. All baby bath tubs are not created equal and there are some that are much better quality than others. We have researched the different baby bath tubs on the market and talked to baby experts to come up with three excellent choices that have great features, good construction and positive opinions from the consumers who have bought and used them. The purpose of our reviews is to save consumers time, effort and money when it comes to figuring out the right choices. Instead of guessing or hoping that you are choosing a good quality product, you will be able to make a confident, informed purchase. If you are looking for the ultimate smart solution in baby bathing, you’ve found it in the Eurobath by PRIMO. Bath time will be fun, safe and convenient for everyone and you won’t need any extra hands. The anatomical shape helps to keep your baby in a position that is safe and that keeps the infant from slipping under the water with supports for arms and legs. This does NOT mean the baby can be left unattended, but it does mean that you can reach for the shampoo without having to worry about the baby slipping. The Eurobath has a 38 quart water capacity and the double position makes this a bath tub you can use from newborn up to two years of age. It is the biggest baby bath available on the market and is designed with safety for the baby in the forefront. Measurements of the Eurobath are 36” long x 21” wide by 10” deep. There is a built in drain for easy and convenient cleaning after the bath. Have shampoos and soaps within arm’s reach with the two areas built into the tub that you can put sponges, shampoos and soaps. The Eurobath conveniently hangs on a wall hook when it is not being used which is a great space saving feature. This baby bath tub is made from polypropylene, non toxic and easy to clean plastic. The Summer Infant tub is designed to allow clean water to flow in while simultaneously allowing the dirty water to flow out. 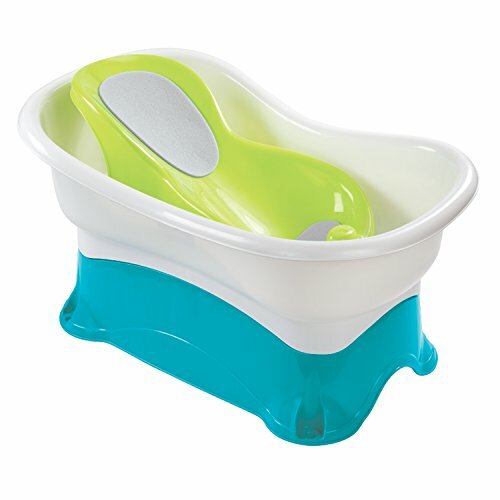 The Summer Infant Tub includes a rinse cup and a built in rinse cup holder. You will find that the tub fits most single or double sinks for the parent’s convenience. Made from durable plastic, with care, this baby bath tub will last through several children and can even be passed down to the grandchildren. If you are looking for a simply designed, functional baby bath tub, this is it. Makes a great gift for baby showers too. Any parent-to-be will be thrilled to get this baby gift for their child and will put it to use often. This is not a tub for toddlers but will work for your baby from newborn up to about 3-4 months of age or until the baby is sitting up on their own. The First Years, a widely loved and well known name in baby products, has created an excellent baby bathtub with lots of features that any mom will love. The First Years bath center works from newborn to toddler, starting with stage one which utilizes the mesh sling that cradles the baby in just enough water to get them clean. As your baby gets older, the bath tub “grows” along with them. Take the sling out and go to the next stage, stage two. Stage two is the baby stopper stage. This insert puts the baby at a gentle reclining position on the foam surface and prevents them from sliding down into the water. Once the baby reaches the age of being able to sit up on their own, he or she is ready to progress to stage 3 of the bath tub which offers a “Sit-Me-Up support that helps babies that are new to sitting up on their own. Stage 4 is the toddler stage and parents can take the sit me up support out so the little one has plenty of room to play. The First Years baby bath tub has a plug for easy draining and cleaning, a hook for space saving storage and easy, fast drying and is made from durable, heavy plastic. Comes with a squeeze bottle and whale scoop for easy rinsing and playing. You may not have realized that there are many different types and styles of baby bath tubs on the market today. These three top rated baby bath tubs are customer favorites and some of the most often purchased designs due to their designs, features and ease of use. If you are expecting a baby or going to a baby shower, any one of these baby bath tubs are the perfect choice for your little ones. It is much easier to give a very small baby a bath in a baby bath tub, and using a tub rather than just the kitchen sink is safer and more comfortable for parent and baby too. We have provided a buyer’s guide below with additional information on buying a baby bath tub. While it’s not a complicated proves, there are some things that you want to look for when you are comparison shopping among the models and styles that appeal to you. What is a Baby Bathtub? A baby bath tub is one of the first pieces of baby equipment that you want to have on hand for your newborn along with a car seat, crib and baby swing. Even though newborns don’t get “dirty” from playing outside, they do have accidents and spit up. Having a safe, easy way to bath your baby provides comfort for both the baby and the parent. A soothing warm bath can be very calming for a young baby and help them get to sleep and feel better from conditions such as colic. Trying to bathe a slippery baby in a kitchen sink can be hazardous, as babies get more difficult to hold onto once their skin is wet. There are a few things to consider and think about when it comes to choosing a baby bath tub. There are many different styles and models available and a new parent may not know which one is the best. This guide will help give you the knowledge you need to sort through all of the styles and choices and choose the one that will fit your needs and preferences. There are many different types of baby bath tubs available on the market today. Below are the various styles that you have to choose from. Standard Plastic Tub – The standard plastic tub is very simple and may have a sloped interior to help support a young baby. These tubs have no special features and are for use only with a young baby that is not sitting up yet. Hammock Baby Tub – A hammock style baby bath tub will hold your newborn or very young baby in place so you have a free hand to wash your baby with. Some tubs come with hammock inserts that can be taken out later once the baby is older. Convertible Baby Tub – Convertible baby bath tubs will grow with your baby so you can use them much longer. Typically the stages are newborn, infant and toddler and will allow for the increasing abilities of your baby. Cushion Baby Tub – A cushion bath tub doesn’t hold water itself but is to be used in a regular bath tub. It’s very easy to use, just fill the regular tub with water and then add the cushion. The water soaks through and provides a sectioned off mini tub for your baby. Inflatable Baby Tub – The potential issue with inflatable baby bath tubs is that they are much less durable than the hard plastic varieties. Inflatable baby bath tubs will come out of the package flat and will need to be inflated. One it is filled with air, it can hold the baby and some water. Inflatable baby bath tubs are not usually used for newborns and many parents simply out the tub in the regular bathroom tub and use it there. 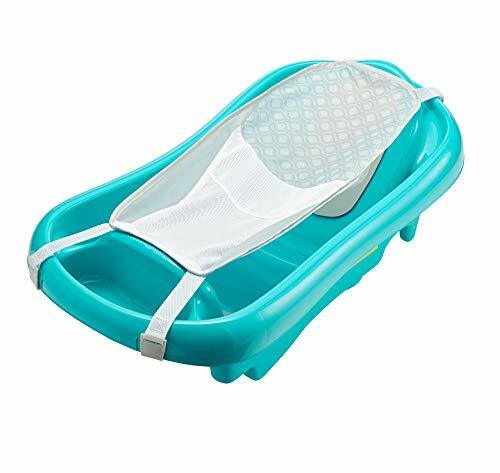 Fold up Baby Tub – Regular baby bath tubs are not known for being compact pieces of baby equipment with the exception of the inflatable variety. A fold up baby tub can collapse into a smaller size when not in use. Typically they fold in half or the foot part of the tub folds over to the head of the tub. They are great choices when space is an issue or for traveling. Luxury Baby Tub – Luxury baby bath tubs are a step above traditional baby tubs. Most are battery operated and can even include such special features as jets that move the water, automatic bubble machines, mini shower nozzles with fresh water and so much more. They are usually heavier than regular baby bath tubs as well. Bucket Baby Tub – These are not as common in the United States but the premise behind these baby tubs is that the buckets hold just enough water and keeps the baby upright. 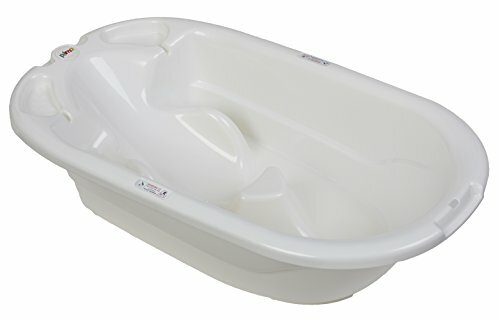 These baby bath tubs are great for calming a baby that is afraid of the bath as it resembles the closeness of the womb. They are very popular in maternity hospitals in Europe. Comparing one baby bath tub to another may seem confusing if you are not sure what to compare. Below are some of the main considerations to look at when comparing different baby bath tubs against each other. How much water does it hold? – Some bath tubs are designed to be very shallow even when they are filled up to capacity. This is a typical problem in fold up baby bath tubs or those that have the pre-molded sloped interior. You want to be certain that the tub you choose has plenty of room for enough water so you are not running out or slopping it over the edge of the tub onto the counters and floor. Does it fit in or over the sink? – Many baby bath tubs are made to sink over a sink. This makes filling the sink, bathing the baby and letting the water out of the sink very simple. Depending on the size of the baby tub, it may work over double sinks as well. If you find that the baby tubs are too big for the sinks, you can set it on a flat surface like the kitchen counter. Remember never to leave the baby unattended in the tub on the counter or anywhere else you may set it. Easy drain capability – Many baby bath tubs have a plug and drain that makes emptying the water easy and simple. Drains will either be located in the bottom of the tub or the wall. A lot of the drains will empty out most of the water but will still leave some water in the bottom. This makes the tub light enough to turn the tub over and empty it the rest of the way. Sticker Strip Indicator – This looks like a sticker that is on the tub somewhere. The sticker will change color according to the temperature of the water. The drawback some find with stickers is that they are slow to change temperature and could result in the water being too hot for the baby. Digital Indicator – Digital readouts are accurate and very convenient to read and show the temperature instantly. The digital readout is attached to the thermometer. Storage Capacity – It’s very easy for baby products to overrun the bathroom. Having a baby bath tub that stores easily is very beneficial to parents that are already dealing with a lot of baby equipment. Many tubs have a hook that can they can be hung on the wall with. Non-slip Surface – Wet babies are slippery babies. It is very common for baby bath tubs to come with some type of non-slip surface to help keep the baby from sliding when being bathed. Baby Bath Tub Rim – There are two important features that you want to look for when it comes to the rim of the baby bathtub. Smooth rim – You want to make sure that the rim of the baby bath tub is smooth with no jagged pieces. You want to scratch your baby’s tender skin when taking them out of the bath or putting them into it. Rim overhang – You want to find a tub that has an overhang of rim from the walls of the tub. The reason for this is because it makes it much easier to carry, especially when it is filled with water. Never carry your baby IN the baby bath tub with water in it or not. Easy to Dry – You want to find a tub that dries quickly or that can be dried quickly. Some parents like to give their little ones nightly baths to help them relax for bed so you want to be sure that the tub is dry. If there is an insert of foam that is never given the chance to dry completely this can lead to the formation of mold, mildew and bacteria. Examine the different baby bath tubs for places that may hold dampness or water where it can build up and cause problems. Baby bath tubs are a regular part of baby care so it is important to get a good quality baby bath tub that will last you for a few years. If you want to get a few different ones over the course of their early years, that is an option to, but there are so many styles now that grow with your baby that you are certain to find one that will fit your needs and preferences. The three top rated models that we have reviewed here are versatile and grow with your baby so you can have them for a couple of years until the baby is old enough to take a bath in the big tub by themselves. The information in this buyer’s guide is written with the goal of giving you the knowledge you need to compare one tub against another and decide which one will fit what you are looking for the best. With the right information, you will never have to resort to guesswork to decide what product to purchase. A confident purchase means one that you will be happy with and that is our objective.